Ask Ranjeet Thakur about how a water fountain or a mixer grinder works, his eyes sparkle with joy as he explains the whole procedure without pausing for a bit. The excitement in his voice indicates how much he loves making science-based models and how deep his understanding of the subject is. Thakur’s little fingers work amazingly fast when he joins the lower half of the bottle, two caps and wires to make a water fountain as his teachers watch in bewilderment the skills this 13-year-old boy possesses. This is an extraordinary achievement for Thakur as he suffers from a kind of neurodevelopmental disorder (ND) and has difficulty in understanding the basic concepts in class. But when it comes to technology, he showcases exemplary knowledge about the whole technique used in making an appliance. “I do not take ideas from anyone. They come to me automatically. I like making different things which involve batteries, motors and wires. I do not like studying,” Thakur said. The usually active and bubbly boy cannot read or write English and can somewhat understand Maths. He became the centre of attention in his Government Model High School in Mauli Jagran district of Chandigarh when he made the model of a chimney during a class project in August, 2018. “It was easy for me. I collected old batteries, old toys and wires and made it. I have also made a water cooler and mixer for my mother at home,” he said, exhibiting a sense of satisfaction for his work. In pure innocence, Thakur claims that dreams about making these machines in his sleep. Thakur was identified as having NDD when his teacher Sandhya Shukla attended the Project Inclusion, a part of Rupantar, orientation in August, 2018. The program educates regular school teachers to identify hidden learning disabilities in students by using simple checklists and then enables them to practice an empathetic and sensitive approach towards these children. The Project Inclusion trainers conduct four-day orientation program where teachers are given information about the types of NDD disorders for the initial two days and then they are asked to identify any such case in their class as per the checklist provided to them during the training. On the last day, teachers are given the knowledge to deal with the identified children till the time they are not assessed by clinical psychologists. Thereafter, special educators/psychologists help teachers along with the parents and siblings of these children to practice the techniques to support the child’s learning inside and outside the school. It also helps in improving retention and quality of life of children suffering from NDD. A total of 276 government school teachers attended the May-August 2018 training that was held in 9 batches in Chandigarh. “During the training, I got to know what the different kinds of hidden disabilities are. Ranjeet’s case was in my mind and I could relate his behavioural pattern with those being told during the program,” she said. Shukla said that Thakur has extraordinary IQ level but he lags behind in class due to his inability to read and write. Children suffering with neurodevelopmental disorder generally go unnoticed as their behaviour is normally seen as abusive, aggressive, naughty, inattentive or reclusive. Due to these traits, they are mostly avoided by their classmates and teachers, as a result of which they develop low confidence and prefer to remain in their shell. Situation gets worse when even parents of such children are not able to understand their problem and do not make the effort to know the actual reason behind their condition. Things were not different for Thakur as his family has always thought of him being disinterested in studies. “He is not utilising his mind in studies. He spends all the time collecting waste material from home, outside and even garbage to make all these things. I would be happy if he starts studying,” said Jaiprakash Thakur, the boy’s father. Jaiprakash, who is a barber by profession, said the he wants his son to be successful in life and not end up like him. Sunandini Bhardwaj, Project Inclusion trainer who has forwarded Thakur’s case for assessment, said the boy may be suffering from neurological condition called learning disability. Explaining further, she said that such children with learning disability have normal intellect but the only problem is in their neural connectivity. This condition interferes with their basic skills such as reading, writing, organizing, time management, abstract reasoning, long or short term memory and attention. Talking about the boy’s dreams about machines, Bhardwaj said that he can be experiencing one of the stages of creative thinking called illumination. “This is a stage in which the person is not directly thinking about the problem but subconsciously working upon the solution by making connection between ideas. Once he dreams about the solution, he moves on to next stage of creative thinking called verification in which he executes the solution he has dreamt about,” she said. With Thakur being identified and his case taken up for assessment, his teachers and parents will be trained by Project Inclusion experts on how to support him and fulfill his dreams. Gunjan Saxena is eager to share the problems of two of her school students. She suspects the duo to be having some kind of hidden disability that separates them from the rest. Being the headmistress of Government Primary School in Narayanpur block of Hapur district, she has her hands full. Still she keeps herself updated with the progress of students in her school. She has a feeling that one of the students class 4 students, Suhail, is suffering from Attention Deficit Hyperactivity Disorder (ADHD) which makes him impulsive, hyperactive and inattentive, while another student of class 2, Anas, is a slow learner as he is showing symptoms like poor memory, lack of focus, is unorganized and talkative. “I want these children to improve. 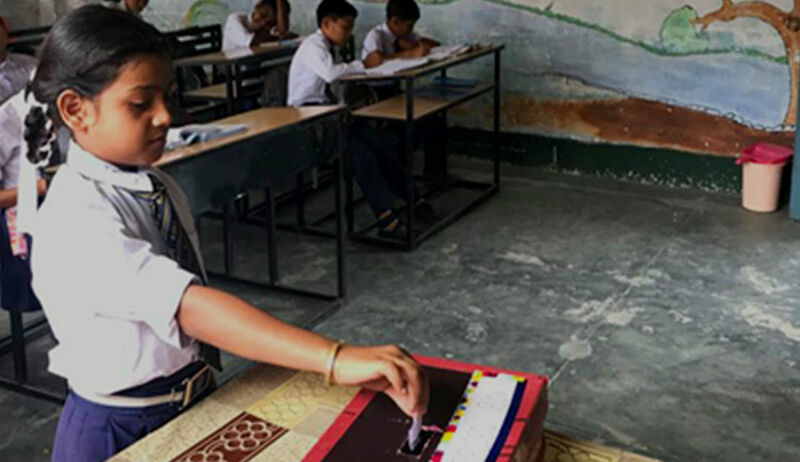 My role as the head of the school will have no purpose if I am not aware of each and every child in my school and am not able to provide inclusive education to all,” she said during the Project Inclusion training session in Dhaulana block of Hapur district. Saxena became aware of these hidden disabilities during the Project Inclusion training of Sri Aurobindo Society in Hapur district. It provides regular school teachers with tools and techniques to identify and support children with mental health issues. Thereafter, special educators also help parents and siblings of these children to support the child’s learning inside and outside the school. The aim is to improve retention in schools and the quality of life of these children. While talking about these students, Saxena categorically points out their problems and explains her efforts she has taken till now to help them. “I visit their houses and counsel parents but they do not understand. They feel bad if you point out their child’s mistake again and again. I also make these students to sit with me during lunch break and play indoor games as they enter into pity fights with other students, she said. Saxena hopes that the training will help her deal with the problems of children with disabilities in a better way. For Gargi, another teacher who attended the training, said the Project Inclusion training is more about personal development. “We have to bring a change in our attitude towards these students first and then we have to find ways to keep these children in the mainstream education,” Gargi said. Explaining about Tamanna, a suspected slow learner, she said that the girl stammers and is a below average student. She gets aggressive and has difficulty in understanding the basic concepts in the class. “I myself used to get irritated while teaching her but now I understand that she has a problem that needs to be addressed and I need to be patient,” she added. These teachers are among the 21 in the 7th batch attending the 4-day training. Over 300 teachers have till now undergone the July-Oct, 2018 training and have submitted over 167 case studies of children with suspected neurodevelopmental disorders. 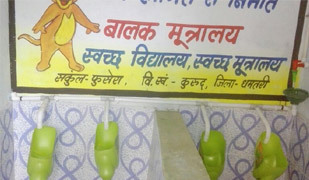 Gaurav Kulshreshtha, Manager Project Inclusion who is also heading the training sessions in Hapur, said that the aim is to reach each and every teacher and make them aware about the hidden mental illnesses among children that often go unnoticed. “Not a single child with hidden disability should be left behind. Every child deserves a chance to thrive and follow his/her dreams. Our efforts are just a small drop in the ocean. The real work is done by the teachers who go the extra mile to bring these children to the mainstream,” he said. This ZIIEI innovation has helped teacher Laden Pulger to bring the children out of their shells and report any issues troubling them, including sexual abuse. Incidents of sexual abuse, eve teasing and other stress-related issues troubling students led Laden Pulger to find a solution that was simple yet effective enough for students to express their concerns without hesitation or fear. 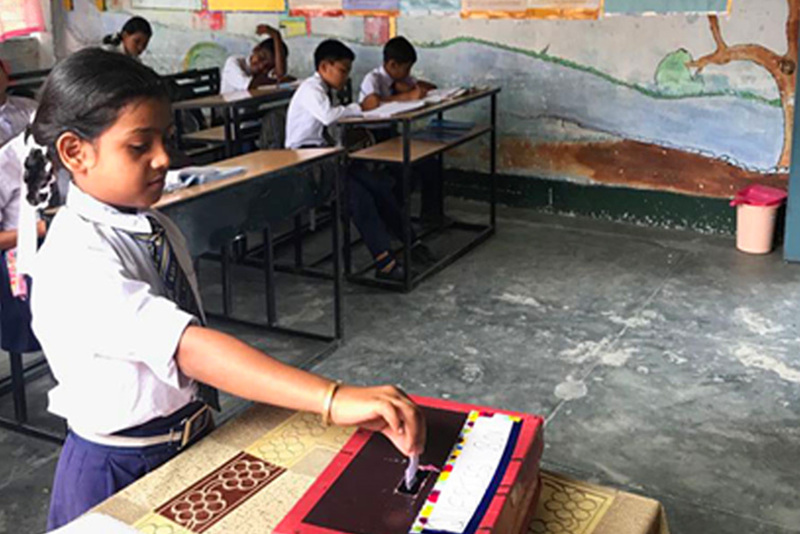 This Social Studies and English teacher at the Government Junior High School in East Sikkim district introduced a postbox in her class to encourage students to find answers by posting letters to the teachers or friends they want to reach out to. In the ZIIEI Innovations Handbook, this innovation has been hence termed as ‘My Postbox, My Voice’. These letters, sometimes anonymous, are about reporting any unpleasant incident they faced or ask questions to the teacher about deeper meanings of things children observe, about a complicated situation in a story they have read in the class, or these letters can be to say ‘thank you’ or ‘sorry’ to classmates. The most important aspect is that the Postbox makes children feel comfortable while sharing even the disturbing incidents of sexual abuse or difficult situations in family or neighbourhood. “Where I found it most useful was in tackling stray eve teasing incident in the school. Children, especially girls, feel hesitant and embarrassed while talking about such occurrences. I counsel and ask the students not to write their names if they are not comfortable with it,” Pulger said. “In today’s world children are very vulnerable and are exposed to all kinds of anti-social elements. If we do not advise them, they can be exploited. We have to control the situation before the matter goes out of hand.” she added. Her school has a strength of 120 students where 60 percent of them are girls. The teacher is one of the innovators of Zero Investment Innovation for Education Initiatives (ZIIEI). She had submitted her idea to ZIIEI during the teacher orientation sessions in her block and, as a result, it was selected and featured in the Innovations Handbook released on 5 Sept 2018. This means that in the next few months, as this book reaches every school in the state, Pulger will see her small idea bringing about a big change in hundreds of other schools. ZIIEI was launched in Sikkim in Feb 2018. Over 7,000 teachers were oriented to the concept of zero-investment innovations and Pulger’s idea was chosen from among 4,500 plus ideas submitted by the participants. “Girls and their mothers now understand that their lives can go on smoothly even during their periods. They do not have to stay away from school and miss their studies due to this. Now girls rarely miss school during menstruation,” she said.